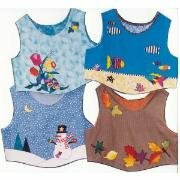 The Seasons Pop Top offers four fun fusible applique designs on a flattering, curved-waist vest alternative that drops over the head. Winter features a snow scene complete with snowman. Spring has a bouquet of tulips, daffodils and pansies. Summer offers tropical fish in fun fabrics with a beach theme. Fall has a sprinkling of oak, maple, pecan and ivy leaves. Create a fashion statement for every season of the year! Pattern includes all sizes 8 to 18.